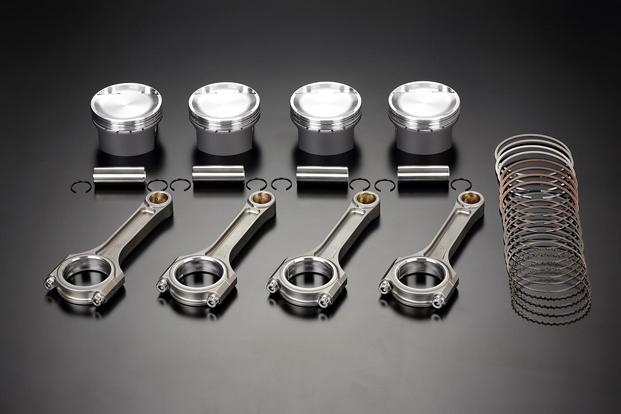 Increased compression ratio and strengthened connecting-rods designed to help produce higher power outputs for tuned K24A engines. Also for tuners changing to the K24A block from the original (2 liter) block, you now have a choice of TODA head gasket to complete the swap. Two TODA High Stopper Metal Head Gaskets have been designed one for DC5/EP3 cylinder heads and one for CL7/FD2/FN2 cylinder heads to work in conjunction with the K24A block. *The cylinder block must be for CL9/RB1 to use with TODA head gasket. Based on TODA piston pin diameter. *3:The cylinder head combustion chamber volume of 51.5cc was used. *4:The compression ratios given above are only to be taken as a guide, measurements are required. *6:TODA head gasket can be used only for CL9/RB1 cylinder block.